CBT is a collaborative therapy that supports individuals to change how you think (‘Cognitive’) and what you do (‘Behaviour’). These changes can help you to feel better. Making changes in what we think will affect what you do and feel, and changing what we do, affects the way we think and feel. Making these changes then can help us feel better. Unlike some of the other talking treatments, it focuses on the ‘here and now’ problems and difficulties. CBT acknowledges the past but it looks for ways to improve your wellbeing now. People can get into habitual patterns of thinking. People with anxiety often have patterns of thinking that are fear related. People with depression often have patterns of thinking that are negative related in their past, present & Future. 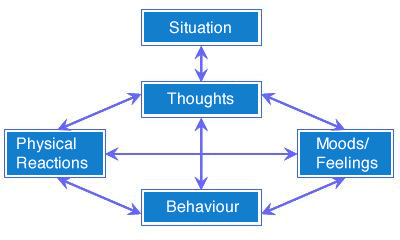 CBT can help you to break these vicious cycles of negative thinking, feelings and behaviour. CBT has been shown to help with many different types of emotional and psychological issues including anger, anxiety, depression, panic, phobias (including agoraphobia and social phobia), stress, bulimia, obsessive compulsive disorder, post-traumatic stress disorder, bipolar disorder and psychosis, low self-esteem, chronic pain and chronic fatigue. CBT empowers the individual to address their low mood by helping them to interpret their reactions to situations. CBT is not a quick fix. A therapist is like a personal trainer that advises and encourages – but cannot ‘do’ it for you. A: An important first step is to set goals. Ask yourself, “How would I like to be different by the end of therapy?” Think specifically about changes you’d like to make at work, at home, in your relationships with family, friends, co-workers, and others. Think about what symptoms have been bothering you and which you’d like to decrease or eliminate. Think about other areas that would improve your life: pursuing spiritual/intellectual/cultural interests, increasing exercise, decreasing bad habits, learning new interpersonal skills, improving management skills at work or at home. The therapist will help you evaluate and refine these goals and help you determine which goals you might be able to work at on your own and which ones you might want to work on in therapy. A: Cognitive therapists, being both practical and collaborative, can discuss the advantages and disadvantages of medication with you. Many patients are treated without medication at all. 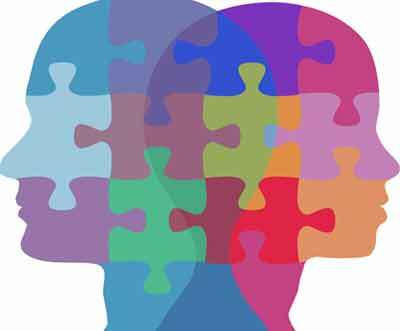 Some disorders, however, respond better to a combination of medication and cognitive therapy. If you are on medication, or would like to be on medication, you might want to discuss with your therapist whether you should have a psychiatric consultation with a specialist to ensure that you are on the right kind and dosage of medication. If you are not on medication and do not want to be on medication, you and your therapist might assess, after four to six weeks, how much you’ve progressed and determine whether you might want a psychiatric consultation at that time to obtain more information about medication.